Non-fiction – hardcover; Text Publishing; 256 pages; 2013. Review copy courtesy of the publisher. It might seem strange for a book lover to admit, but I tend to stay away from books about books. That’s because I’d rather read the books that are mentioned in the books about books. 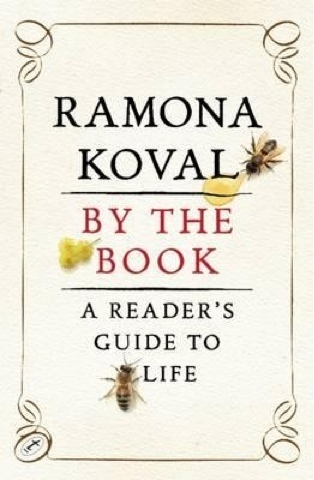 But I made an exception for Ramona Koval’s By The Book: A Reader’s Guide to Life because I have such respect for Ramona as a journalist and broadcaster, and I was intrigued to see which books had meant a lot to her during her lifetime — a bit like an extended Triple Choice Tuesday, if you will. And I wasn’t disappointed: this is a lovely book that entwines Ramona’s memories of growing up in Australia, heading to university, getting married, becoming a mother and pursuing a scientific, then literary career, with the books that have had an influence on her life. It’s not strictly chronological, because many of the chapters are arranged thematically — for instance, books about travel and exploration, books about science and “big projects” and books about womanhood and relationships — but the common thread throughout is the way that the books inform Ramona’s life — and vice versa. Or, as the Australian Book Review, so cleverly pointed out, it is an “irresistible study of the symbiotic relationship, for the bookish, between life and books”. Reading a book, my mother would stretch out in our lounge room on one of the deep purple divans that would be made up later into beds, her soft body covered in a blanket, her attention absorbed by the pages in her hands. She was lost to us. And her father, also a Jewish Holocaust survivor, introduced her to the power of storytelling at an early age by telling her dark moral fables about not reaching for things beyond your grasp, “the opposite of romantic stories about heroic adventures and magic powers and brave quests”. Similarly, anyone who’s a reader will remember when they joined a library for the first time. For Ramona, it was the intimate nature of Camberwell Mobile Library — much less imposing and daunting “for immigrant families like mine” than the main library — which became such a source of great joy when she joined it, aged 10. So Mama took my hand and got me registered, and I had a card of which I was as proud as my parents were of our house. I was shown which books were for children and which for grown-ups. But I quickly tired of the children’s section. I discovered that, as I lay on my belly on the bus floor, with its smell of lino and rubber, I could read the spines in the adult section. There I spied Kafka and Kazantzakis, Kerouc and Koestler. There I learned to put things in alphabetical order. Of course, I could keep on quoting endless chunks of this book, because I identified with so much of it — how we grow and change as readers over time, how we pursue certain themes and topics in our reading, how we learn and grow from what we discover and how literature expands our horizons. But I won’t, because you really need to read this book to see for yourself how brilliantly Ramona nails the relationship between a person’s life (and experiences) and the books that they read. What I liked most was how the narrative expertly interweaves Ramona’s own story with stories by other people. And even though she’s incredibly well read, it’s certainly not pompous or elitist, but very down to earth, warm and conversational — just like her broadcasting style. In fact, opening the pages is a bit like sitting down with Ramona over a cup of tea and having a lovely old natter about books. It’s such an enjoyable treat — and I can honestly say I was sad when I came to the last page. Fortunately, the journey doesn’t end there, because By the Book: A Reader’s Guide to Life has an appendix listing all the books mentioned in the text so you can pursue them at your own leisure. Needless to say, I’ve already added several to my wishlist — and no doubt, you will too. I actually like reading books about books. It always builds my TBR list, so I am quite looking forward to this one. Glad to hear good things about it. I too love books about books. Or books about readers. Or books about bookish quotes. In fact books about anything remotely bookish so this is going straight onto my wish list! Great review Kim, thanks. I enjoyed this book for all the reasons you wrote in your very good review. Ramona Koval is not only an engaging personality, but also a perceptive and honest writer. For instance, she talks about all the feminist literature she read and yet, with those words ringing in her ears, she married a man who had no appreciation of feminism. She doesn’t take herself seriously but she takes reading very seriously it’s a great combination. I think my fear with these kinds of books is that they will somehow make me feel inadequate as a reader, because the writer will have read and name-checked all the classics, and I’m not much of a classics reader. But Ramona’s book is not like that at all. This one has definitely made my wishlist grow a lot longer. I hadn’t heard of Ramona Koval before reading your post but her book sounds well worth seeking out. Lovely quote about joining the library which, inevitably, made me remember my own Friday evening trips to our local library with my parents. Thanks for that! I love books about books too, although some seem to reference all sorts of classics I’ve never read and make me feel like I’m some sort of imbecile! Good to know this isn’t the case – must check this one out. Like you, I tend to avoid non-fiction books about books, but I did enjoy listening to Ramona’s radio book show, so I was torn. I’ve been hosting an AusReading Month during Nov – maybe you would like to leave a link of this review here…http://bronasbooks.blogspot.com.au/2013/12/ausreading-month-end.html#comment-form ?? I’m so glad you read and wrote about this book. I loved the conversational tone and her irresistible personality. And then there’s the additions to the to-be-read list.